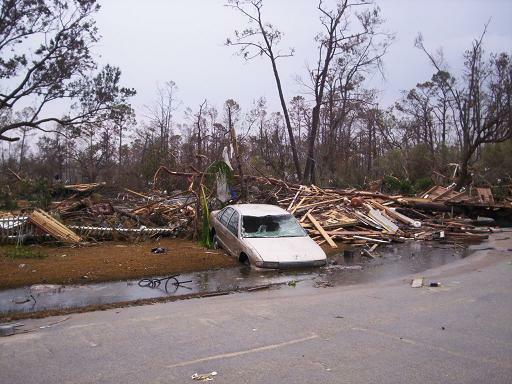 Hurricane Katrina hit Waveland - "Ground Zero" - on 29 August 2005. At that time we lived in a small, lovely town called Waveland, MS, and just 4 blocks from the beach. Waveland was the perfect "small town USA" environment. 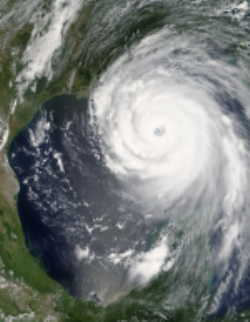 We learned that Katrina was headed straight for us late Friday night, August 26th, while at a beach party. I was the Emergency Evacuation Officer for our Navy Command which was located in New Orleans. That morning we had heard that the storm had only a 10% chance of moving our way. I even hesitated to brief our command on the situation. Then at about 10 pm, Friday night, our lives were about to change forever. even though Ray Nagin, N.Orleans mayor, had not ordered an evacuation of the city. This is our story in pictures. Click on some photos for a larger view. Our home on 28 Aug 2005 (Saturday) before the storm. David, my husband, was exceptionally proud of his grass which he said was like a golf course. 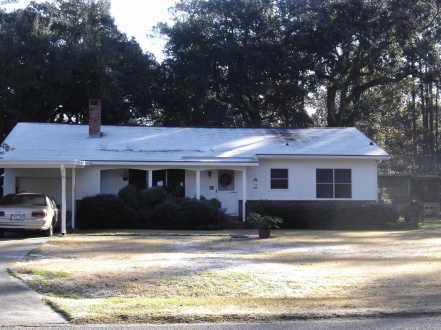 Our home was located on Sears Avenue in Waveland, Mississippi. It was a beautiful day and hard to believe that a storm was coming. and we were told that if you stay... quote... "you are going to die". as of 10:11 a.m. Sunday, the day before the storm, stressing the damage and urgency. 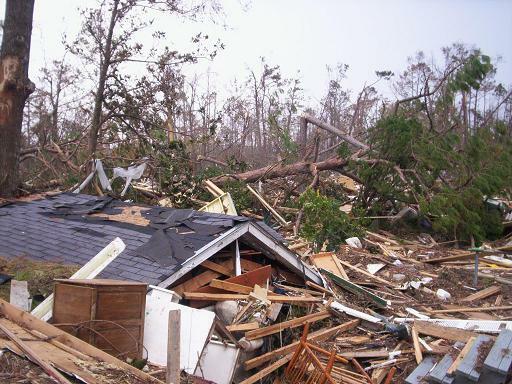 Our home on 2 Sept 2005 or 4 days after the storm. We did evacuate to Mobile, Alabama, or I would not be typing this now. Two days later, we got word that some of our neighbors got into the area. They warned us it was dangerous and difficult. It took us about an hour of climbing over rubble just to get to the house that day. The car belongs to Gloria Smith, a neighbor across the street. We never found a great majority of our house. Parts we did find were 2 or 3 blocks away. 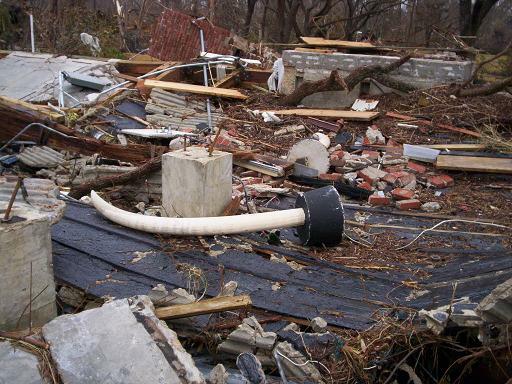 The rubble in this photo is not of our home, but of other homes that were around us. Our back yard before the storm on 28 Aug 2005 with beautiful oaks and plants. I was a Chief Petty Officer in the Navy and this was to have been our retirement home. Notice the boards below the windows. 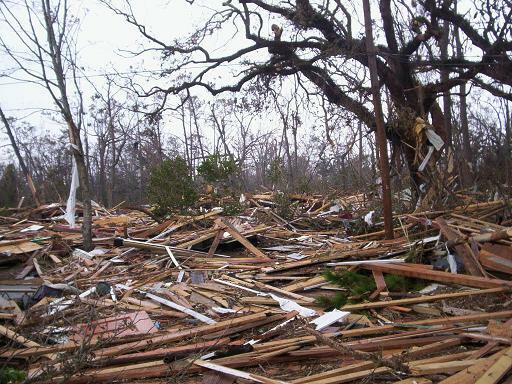 Our back yard after the storm on 2 Sept 2005.
but from homes that were near the beach and parts of a pier. 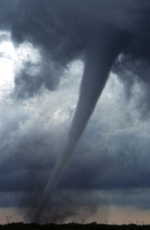 NOAA data reported that we had 12 tornadoes pass over our property. 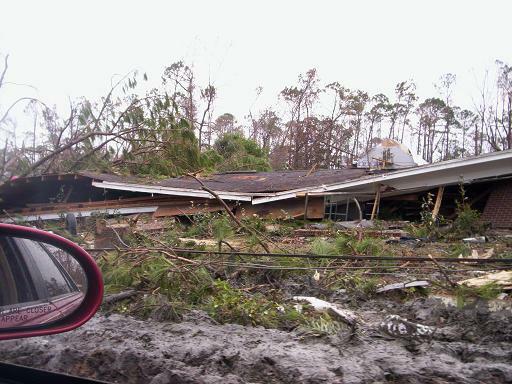 Twelve tornadoes in addition to the 33 foot storm surge and 115+ mph winds. Cheryl Phillip's house, my neighbor, before Katrina. Photo taken 27 Aug 2005. Cheryl was so worried about the situation that she got in her car and left. She did not even wait to board a single window. We then met people walking their dogs, or washing their cars, not seeming to worry at all. 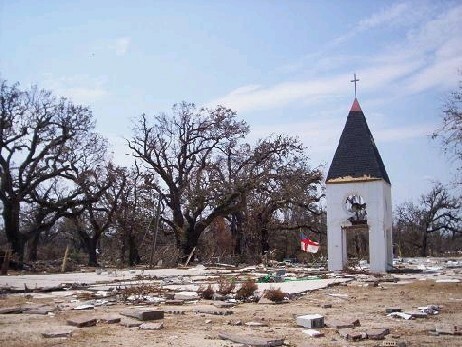 Most had survived Hurricane Camille which hit in 1969. They told us they were staying. Later, we heard of no survivors in our immediate area after Katrina. 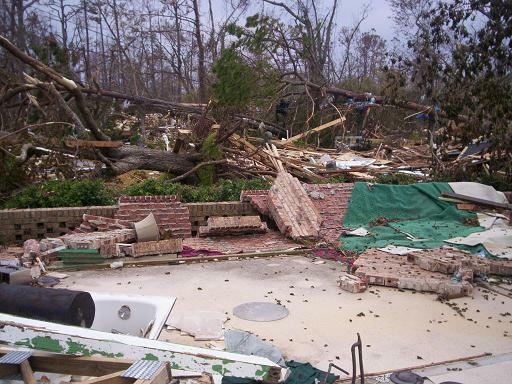 Cheryl Phillip's house after Katrina. As with every home, nothing was standing. In hindsight she was right to just leave. 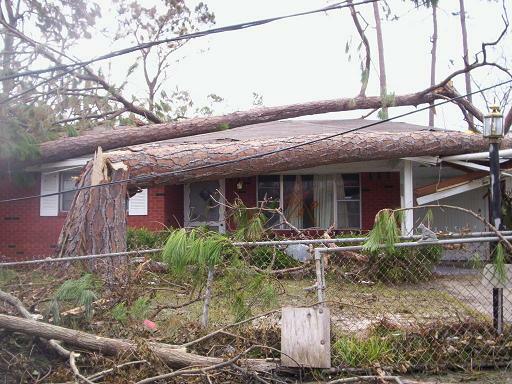 Gloria Smith's house, neighbor, before Hurricane Katrina hit. Gloria was a retired widow. A caring and lovely lady. 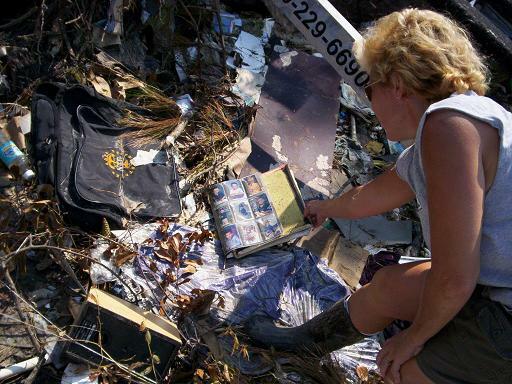 After Katrina, Gloria was told she would get insurance for her roof only. To this day, Aug 2015, Gloria still lives in a FEMA cottage which has about 300 sq. feet of living space. 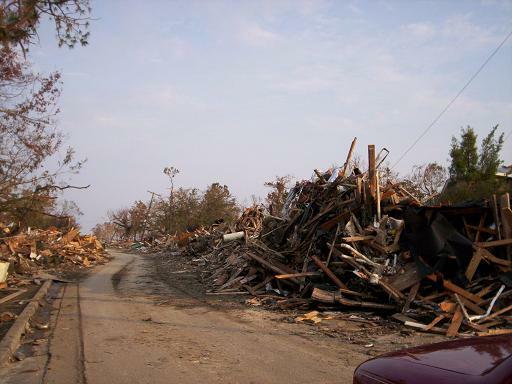 Gloria Smith's house after Katrina. All that was left standing was the toilet. 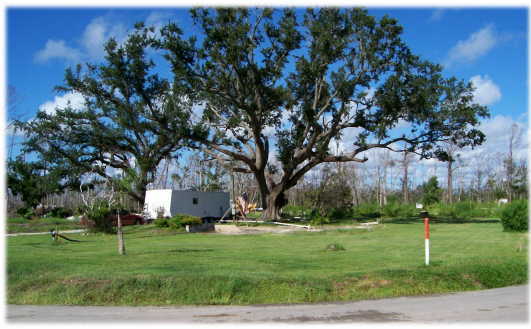 Mrs. Gwen Hogan's house before Katrina. Photo taken on 28 August 2005. Her house was on Beach Blvd, Waveland, which is the road that runs along the beach. We were the first to tell Gwen the status of her home. It was one of the most difficult calls I've ever had to make. 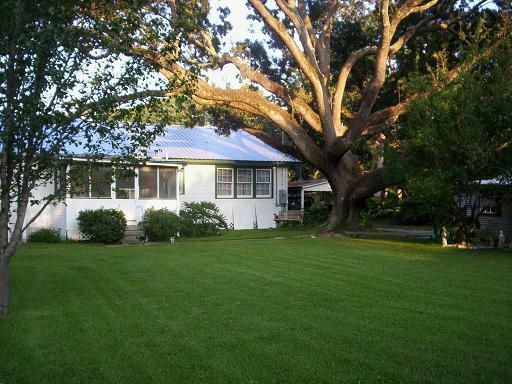 Her husband, an industrial contractor, had built her house to be as "hurricane proof" as possible. 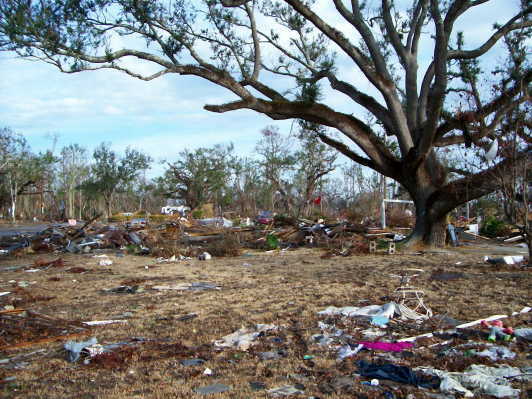 Gwen Hogan's house after Katrina. We never found the house, walls, or roof and we looked for 2+ years. We walked back 2 acres and still never found any of her things. She had mounted elephant tusks from from a hunting trip her late-husband took in the 1960's. They were heavy and fell when the house gave way. Edna "C.J." Duncan's home; neighbor. 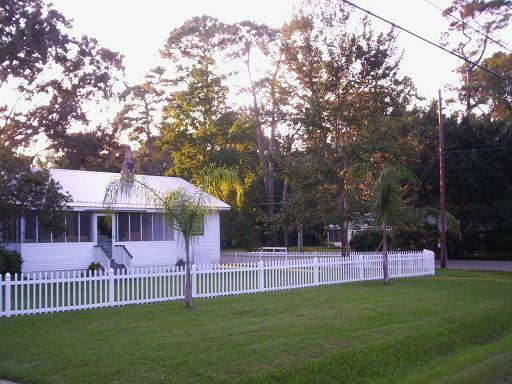 Waveland was dubbed "Ground Zero" on the news as we were on the worst side (right side) of the hurricane when it hit. 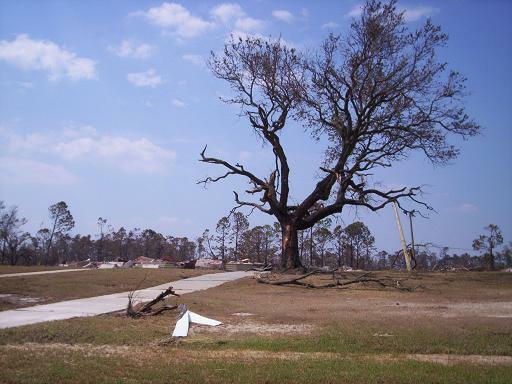 Nothing was left standing and/or intact anywhere for miles inland or on the coast. Sears Avenue - 2 Sept 2005. This is a photo of the street and why the news reported that we were "wiped off the face of the earth". Homes were marked when searched. If a dead person was found a number was placed at the bottom of the marks. This one was marked on the window. We saw these all over Waveland. It was reported that about 50 people were found dead in Waveland. Farrar Drive. This house was marked on the roof. My father had just bought this house. In fact he never even saw it after the sale. I put my Honda Rebel motorbike in his shed for safe keeping in the storm. 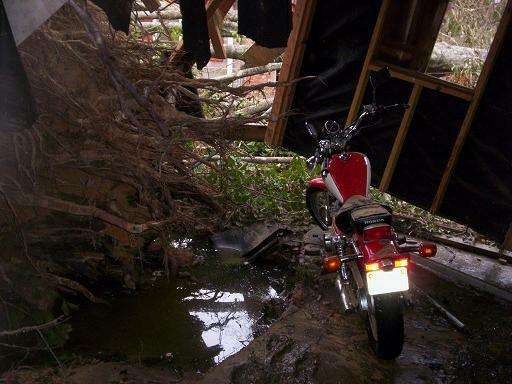 Despite the uprooting of a tree next to the shed, my motorbike, besides being flooded, remained intact. The kick stand was less than one inch from the hole made by the uprooted tree! All that's left of Michelle and Barry Zeeman's home. It was a brick home. They were my neighbors. 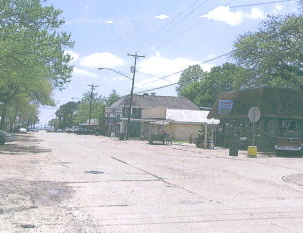 Coleman Avenue, downtown Waveland, before Katrina. Same angle, looking down Coleman Avenue towards the beach. Coleman Ave was the downtown area where City Hall was. It was lined with quaint shops and oaks. Here it has been plowed by huge Army bulldozers. Every beach home we saw looked like this. Stripped bare by the 30+ foot storm surge which was like a tidal wave. Parts of Waveland got a 26 foot storm surge. But we had silt on the old oak tree on our property. When we measured we got a height of 33 feet where we lived. The greatest miracle is finding any photographs. This is part of my son Kyle's baby book which I forgot to take when leaving. It was handwritten notes of what happened the first 4 years of his life. Unfortunately I did not find any of that. I will always regret forgetting to grab that book. Sitting unprotected and out in the open, was this photo of my son Kevin. It was a single photograph which was beat up but right in the debris. We found it 4 blocks from where our home once stood. In fact we took this photo as we were making our way to our house. could have fit into a small car trunk. All that is left of a child's toys. 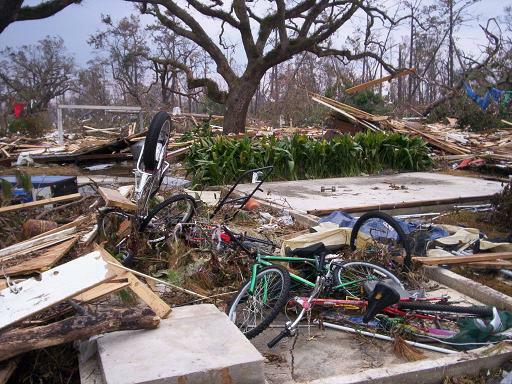 All that remained of our shed and children's bikes. We were told according to NOAA data that the massive storm surge came in at 26-30+ feet at 17 miles per hour. wonderful friends, and great town in which to live. How do you sleep after losing your house? On the ground of course. towels for blankets, and toilet paper rolls for pillows. Looks bad but thank God for those who risked all to get in there and help us initially. The author of this website in my neighborhood. I carried a knife and gaff that day. they asked if I was using the knife and gaff to kill wild animals, alligators and snakes! and the knife was used primarily to help me open the MRE or 'Meals Ready to Eat' containers. They liked thinking I was killing snakes a whole lot better. My sons found a flag in the rubble and decided to make the best of the situation. There just seemed to be no end to the destruction. Here my sons are sitting on what was a brick stairway to a house. 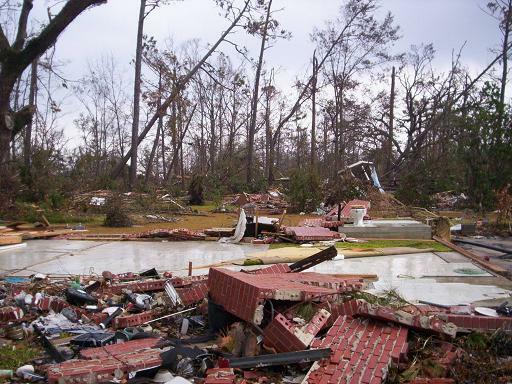 One of the worst things was being the first to call and tell people that our church was destroyed. In the rubble, I saw sitting in a truck, one of my church friends. She was an elderly lady, consumed with grief. As I went to comfort her, there was little I could say to ease the sorrow of the situation. But that is when churches from around the country came and saved us all. With their smiles, love, and support, we were able to 'survive the storm'. The churches and volunteers did more for us than anyone else. If only our government had been so caring. After several months of waiting, we decided to have some fun with our friends at FEMA. 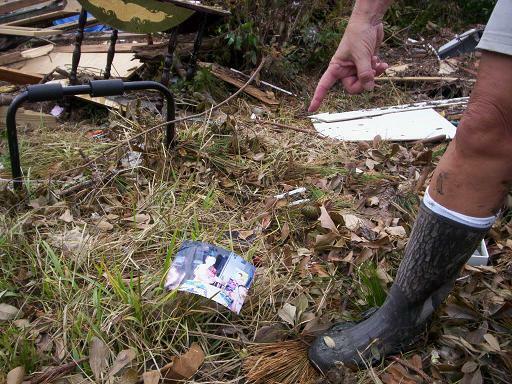 Just as we set this prop up, and were laughing about it, FEMA showed up. The workers posed near the car, and said they would help. as we learned they were not going to help beyond the trailer. We had a visitor to the beach. A 6-foot alligator who was found sitting in a drainage area just one block from Christ Episcopal church grounds. 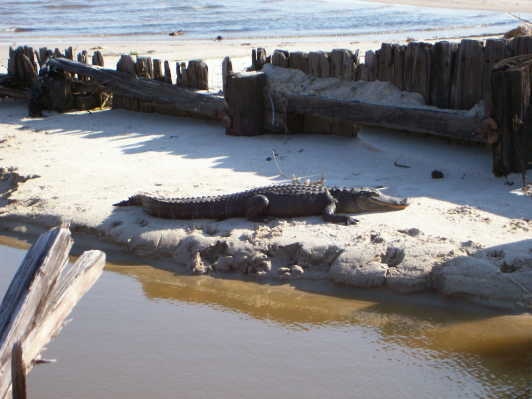 The police came, all very young, and nearly died when the alligator lunged at them. They said they were calling a trapper, who never showed up. Our property in August 2006. This photo was taken on the anniversary of the storm, a full year later. but our grass returned after we had over 25 volunteer groups to come and help us. The trailer in the photo is a FEMA trailer. And did you know that FEMA trailers were inspected monthly? Well... not really. Someone would come, you sign a paper, and they say they had "inspected". We later learned workers received payment for each signature obtained. One inspector actually came inside the trailer to talk to me. She candidly told me that Hurricane Katrina was caused by the Space Shuttle! which then caused the storm to grow like it did. I asked her what she did before she was a FEMA inspector. She said she had worked at a McDonald's drive thru. June 2014: After endless hours of work, years of cleanup, and a bulldozer, we had finally gotten rid of the endless piles of debris. Our lot sits quietly where a house once stood. A house has been built there, at a height of about 24 feet. It is not our house. We moved away. We are grateful to all of the volunteers, especially church groups, for helping us in our time of need. We truly did not ever want to be called a "victim", and we have tried to recover to the best of our ability. The reality was that the cost was immense, and recovery was very slow. We learned to live with little, and we learned to appreciate our Lord and all that is important in life. Today David and I live on a mountain top in Tennessee. The storm scared us so much that now if we have a flood, the world is ending! We have a church, friends, a home again, food and have recovered. But the memory of those days on the coast will always be with us. 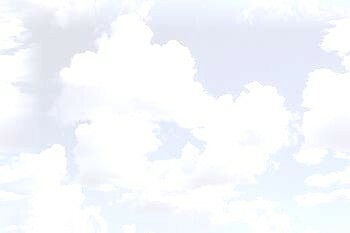 I still worry when I hear that bad weather is approaching of any kind. 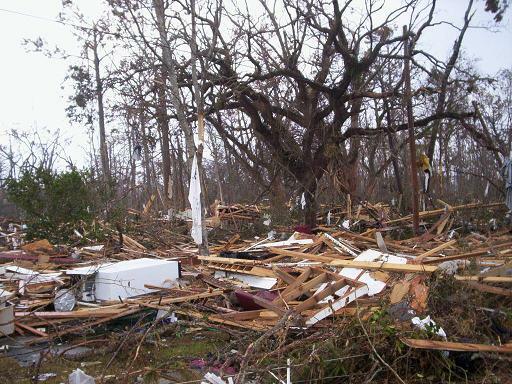 Had we stayed and rebuild in Waveland, I don't think we could have ever gotten away from those days. Do not second guess this. Do not under estimate the power of this type of storm. 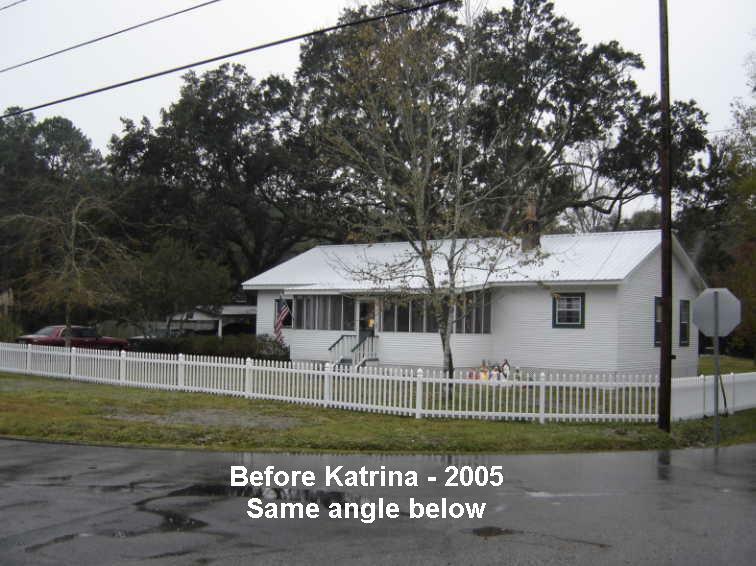 Had we stayed in our home during Katrina, we would have been killed. Your five or six foot frame cannot withstand the power of a 200-500 mile wide storm. Learn, heed, live from our experience. Last word: I have heard people tell me that the news media overstates the damage a storm can cause. That, my friends, is ridiculous. Had they not stressed the danger, we would not be here today. Ask any Hurricane Katrina survivor. Thank God for those that warn and inform us. Author of "A Personal View"
2018: A new family home has been built on the old lot. We wish the family every blessing and to be safe should a storm return.